I went to my glass club meeting and a gal was wearing a necklace made out of satin cord with dangles on the bottom. 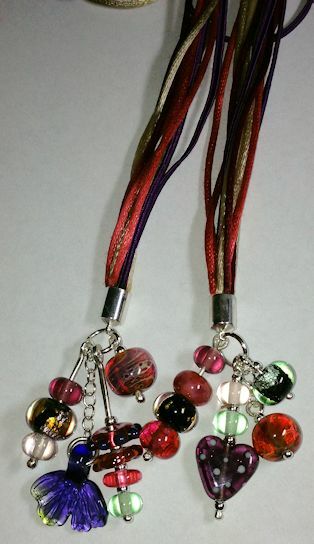 I really liked the colorful look of the necklace and knew I had to make a similar one. Here’s my take on the necklace. It’s long and can be knotted or tied depending on the length I want it. This is going to look great with my black dress that I’m still waiting for the pattern to be mailed out.